Offering retailers the opportunity to learn about new, unexpected ways to use tablets in-store without encountering slow, unreliable Internet connectivity, is Retail Cache. The Retail Cache alleviates network consumption and enhances the in-store Web browsing experience for consumers and employees. 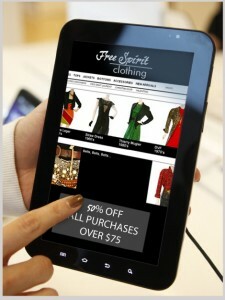 With the Retail Cache, website content is available to customers at the local, in-store wireless network speed, providing much faster speed connections. Retailers have the option to pre-populate the cache with specific content their customers want, delivering the most bandwidth-intensive applications to dozens or hundreds of online shoppers at once. Drawing big attention also is STRATACACHE’s Digital Play Solution, a new, interactive solution empowering customers to become more involved in the shopping experience. Digital Play solution displays high-definition, interactive product and brand messages programmed to respond when a consumer interacts with sales and marketing content via motion-based gestures. For consumers of all ages, with the wave of a hand or stomp of a foot, retailers can promote products and interact with customers all along the path-to-purchase. The Digital Play experience engages consumers to interact with featured messaging, increasing customer recall five to seven times more than a standard digital sign. Virtual Reality displays products or services within a virtual environment, using graphics to enhance and contextualize a scene or product. VR is for use with floor projection or wall displays. STRATACACHE Digital Play, which Reigel calls retail’s promotional power tool, brings to mind the company’s enVu, also offering a gesture-based on-the-floor product. However, Digital Play seems to be a more advanced product – although I personally foresee retailers being more interested in the wall aspect rather than the floor. STRATACACHE is a privately-held provider of efficient, scalable and cost-effective digital signage, IP video, content distribution and enterprise video acceleration solutions. Working with over 400 of the world’s largest firms in the retail, finance, service, hospitality, manufacturing, media and government sectors, STRATACACHE’s products meet the performance requirements of large-scale enterprise solutions, while immediately providing a significant return-on-investment to the customer. This entry was posted on Tuesday, January 15th, 2013 at 18:31 @813 and is filed under DailyDOOH Update. You can follow any responses to this entry through the RSS 2.0 feed. You can leave a response, or trackback from your own site.